Croydon Council has agreed to change road markings at the school entrance on Rockmount Road to improve safety for pupils, parents and road users, subject to planning approval. 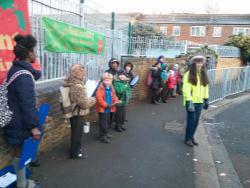 The move comes after three years of lobbying since the school moved the infants from Hermitage Road. Many parents and staff believe the entrance is unsafe – ‘an accident waiting to happen’. Rockmount School is delighted Croydon have finally agreed to add 35 metres of lines to stop cars parking right on the junction where there lots of children and cars. And we’d like to thank Peter McDonald, Croydon’s Travel and transport planning officer, for pursuing this for Rockmount. We hope to see the new parking controls introduced early in the new year once they have had planning approval by the Traffic Management Cabinet Committee. The school has had a lot of success encouraging pupils to walk, cycle or scoot to school. And we would like to thank all those parents who are making an effort to support these efforts or who park a little distance from the school. Wednesday has been earmarked as the day for walking, cycling or scooting to school, which means that at least once a week, everyone has a safe, healthy start to the day. Our enthusiastic pupil Eco-councillors, stand outside the school gates checking, so that we can reward those who do park and stride, walk or cycle with badges once a month. But we understand that leaving the car at home is not practical for everyone. There is plenty of parking by the park on Chevening Road or on other side roads and we would ask parents and carers to park there for drop off and pick up. We are also asking the council to consider the traffic calming measures on Rockmount Road such as a 20 mph speed limit. The local police community support officers are regularly on hand in the mornings and wrote to the council to support the planned changes. We are asking parents and carers to fill out a short questionnaire so that you can voice your ideas on ways to make Rockmount children's route to school healthier and safer.